Following the disappointing box office returns of Solo: A Star Wars Story, there have been some questions about Disney's handling of Star Wars films of late. Specifically, if they may have bit off more than they can chew by releasing two films just six months apart. 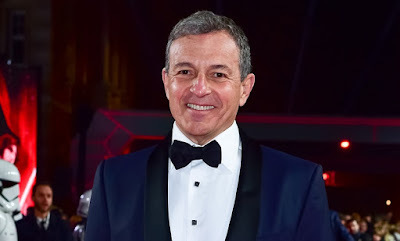 Disney CEO Bob Iger took responsibility for the decision and spoke in vague terms about how they are approaching making Star Wars films after Episode IX (hitting theaters in December 2019) in a new interview with The Hollywood Reporter. "I made the timing decision, and as I look back, I think the mistake that I made — I take the blame — was a little too much, too fast. You can expect some slowdown, but that doesn't mean we're not gonna make films. J.J. [Abrams] is busy making [Episode] IX. We have creative entities, including [Game of Thrones creators David] Benioff and [D.B.] Weiss, who are developing sagas of their own, which we haven't been specific about. And we are just at the point where we're gonna start making decisions about what comes next after J.J.'s. But I think we're gonna be a little bit more careful about volume and timing. And the buck stops here on that." The question that will be inevitably be fueling fandom discussion for the next week is, what does Iger mean by "some slowdown" and "a little more careful about volume and timing"? Can we expect Star Wars to go back to a once a year (in December) schedule? It worked very well for them from 2015-2017 with three films all grossing over $1 Billion. Or should we expect them to slow down even more, and move to once every eighteen months or even once ever two years? It had been previously announced that Disney has commissioned a new trilogy of films from The Last Jedi writer/director Rian Johnson, as well as a new series from Game of Thrones showrunners David Benioff and D.B. Weiss. It was also widely assumed that we would also see A Star Wars Story films about Boba Fett and Obi-Wan Kenobi, as well as Solo sequels. The future of those films seems to be the most in doubt following Solo, with some reports even suggesting that all A Star Wars Story films have been put on hold (though follow-up reports have cast doubts on that). Going back to one movie a year after the extended break between Solo and Episode IX seems like the most likely outcome. As was pointed out earlier, they managed to produce three hugely successful films on this schedule, and it was only when they deviated from their December release dates did things start to come apart. Many have speculated that having Solo come out so soon after The Last Jedi was a test to see if audiences would show up for more than one Star Wars movie a year. If that's the case, Disney/Lucasfilm got a very emphatic answer as Solo is the only Star Wars movie ever not to make money on its initial release. Another possibility is that Disney/Lucasfilm may look to streaming to take some of the pressure off the theatrical releases of Star Wars. Disney is putting a huge emphasis on their upcoming streaming service and we already know that there will be two high profile Star Wars shows on the service, one being the return of The Clone Wars animated series and the other being a live action series from Iron Man and The Jungle Book director Jon Favreau. Favreau's series alone is expected to cost $10 million an episode ($100 million for a season). Perhaps we could see a situation where by putting enough Star Wars content on the streaming service they feel they can move to a once every two years release schedule for the films. Earlier this week it was reported by Variety that Disney is preparing for several limited run series focusing on characters from the Marvel Cinematic Universe for the streaming service. These series, which will reportedly focus on Loki and Scarlett Witch first, would see the actors from the films (such as Tom Hiddleson and Elizabeth Olson) reprising their roles. Some fans have already suggested that this could be a way of continuing the story of Solo, rather than making sequel films. In theory, it would be less expensive (even if it costs $100 million to make, that's still less than the $250 million budget Solo had) and more content. Hopefully it's something Disney is at least considering. Most who saw Solo enjoyed it and would love to see more from Alden Ehrenreich as Han, Donald Glover as Lando, and Emilia Clarke as Qi'Ra (as well as more from that other guy who showed up at the end). With the end of the sequel trilogy upon us, we are once again about to enter uncharted territory with Star Wars. While there are lots of questions, there are also lots of opportunities for Lucasfilm and Disney to do some really exciting things with the galaxy far, far away. We just have to wait and see what they decide on. Honestly there isn't really anything wrong with it. If anything I think it's probably for the best. Now let's say if that if there isn't a film in 2020 I think that will help EP 9 and the Sequel Trilogy and let people stew on it for a while espeically because let's face it no matter what the ending will be controversial. It also allows fans to take a break and breather after so many movies insure there is less chance of Star Wars burnout. So I think this probably a good move-plus we always have TV, comics, books still going. Stop hiring bad directors and no similarity actors and you could be game no matter what. Solo? I got a good bet on how you get a Solo actor. Just watch Han Solo: A Smuggler's Trade (A Star Wars Fan Film) with Jamie Costa and Solo could had been a box office success any day of the week. Rouge One is probably the best Star Wars movie since Episode IV a New Hope. Learn something from that and go for the best, not what is pulp at the moment.